When my grandfather was alive, his daily morning ritual always began with a McDonald’s cup of coffee. I think he was up as early as 5:30 a.m. for it. He’d fix his belt, grab the newspaper, pack his cigarettes and be out the door. He claimed the coffee at McDonald’s was great. And as early-rising 8-year-olds, my brother, cousin and I used to love sleeping over because we knew we’d get a trip to the establishment that was usually reserved for the bathroom break on a long car ride. Yes, we’d get sticky eating our hotcakes with syrup and margarine, and grandpa would get his caffeine on. For years, he raved about the taste. My parents, lifelong drinkers of D’Amico’s French-Roast and nothing but, bit their tongues. Truth is, there will always be people in this world that are happy with their “decent, moderately strong” paper cups of coffee. Coffee is coffee, they’ll say. [Groan] No, coffee is not coffee. Finding that great roaster of beans is just as important as finding that great butcher of meat. It’s best when it’s done just right. Like a butcher preparing a fine rib roast, there’s a way to cut it so that you’re bringing it home at its most tender and delectable. The same goes for coffee beans. No one likes a burnt bean. Frank D’Amico may not be my granddaddy, but he is definitely the granddaddy of the most famous coffee beans in Carroll Gardens. Not to mention all of the imported olive oils, pesto, pastas, canned goods, meats, cheeses, sauces, crackers and jellies that bedeck this traditional, classic shop. 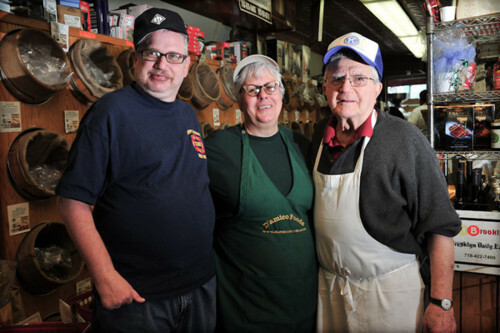 D’Amico Foods is a third generation family business that’s been luring customers in for over 60 years. Frank’s father, Emanuele D’Amico - a Palermitan who jumped ship to Brooklyn around 1925 – was a self-taught man who worked all sorts of jobs. From longshoreman to laundry delivery, Emanuele searched for stable jobs that could support his family of five. In 1948, with an old-fashioned coffee roaster machine and your standard grocery items lining wood shelves, D’Amico began renting the brownstone storefront at 309 Court Street. That romantic bouquet of coffee we smell today - of beans being ground - likely spilled onto the street as if someone were pushing it out then, too. The whir of the roaster, the clang of the scooper… a pedestrian’s senses couldn’t help but heighten with each passing stroll. Joanny D’Amico, who is married to Frank’s son, Francis, and runs the business with him today, recalls the D’Amico scent. Joanny interrupts him, shaking her head. While Frank is eager to divulge the back-stories of the life and times of Italian immigrants during the Great Depression, Joanny and Francis are more concerned with keeping him focused on the store. I like the stories though so I let Frank talk. “What’s that got to do with the store?” says Joanny. Her tone is equal parts love and exasperation. “Dad, it’s about D’Amico’s… not your life. Sylvie wants to know about the store,” says Francis. Frank stares at them both. He appears to be considering it. Today, D’Amico runs on the same principles it ran on 60 years ago: high quality and dedicated service. Never say no to a customer is Frank’s long-standing philosophy. Because if you can do it, do it. Never turn them away. Always find a way to help them. “Once, years ago, a lady was pregnant. I had to take her to the hospital. They called me! I don’t know why they called me,” Frank says with a shrug. When Francis officially took over the business in 1997, he really pushed for the development of the D’Amico website. He knew that as the area began to change, the business had to change with it. Little by little, the blends of coffee grew. More imported food items stocked the shelves. A cappuccino and espresso bar was installed in the back. Keeping the business alive was all about introducing the new. In fact, it was Frank’s idea to promote the area years ago by naming some of the blends after the neighborhoods. “The Brownstone Collection” consisted of 3 blends: Carroll Gardens, Cobble Hill and Park Slope. During the 90s came the Red Hook blend (seeing as it was the “up and coming” area) and sure enough that blend became the store’s bestseller. Today in the store, practically spilling out of their burlap sacks, you have over 100 different blends to choose from. So what do the D’Amicos drink? Francis is quick to correct him. You know what? Here’s to everyone having a preference. Yes, even my McDonald’s-loving grandfather.